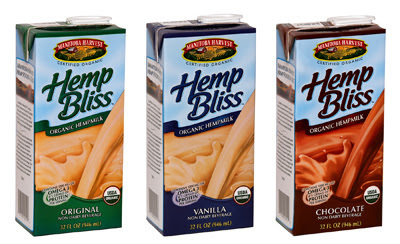 My breakfast cereals and taste buds are salivating for this new "hempmilk" product. Coming soon, says Mike Fata and friends at Manitoba Harvest in their newsletter I got just now. "Happy & Healthy 2007! We hope that you and your family are off to a prosperous start to 2007. We have been working very hard putting together Hemp Bliss, the world's first certified organic hempmilk. It will be available soon in Original, Vanilla and Chocolate for all to enjoy. Stay Tuned!" Ez Sez: Plants putting cows out to pasture where they belong. Seed by seed, box by box.